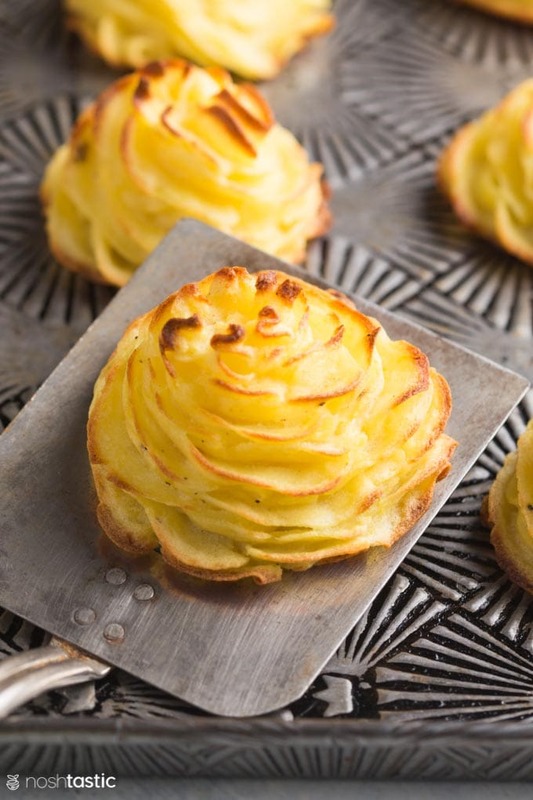 Duchess Potatoes really are really easy to make and don’t they look great?! 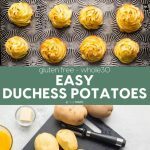 They are a real crowd pleaser year round, but we love to serve our Duchess potatoes every Thanksgiving and Christmas to wow the guests, they are a perfect fancy mashed potato side dish and you really can’t go wrong with them. Make sure you fully peel your potatoes, you don’t want any peel left on the potato. Then cut into even sizes so that they will cook at the same time. 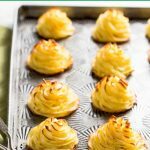 So I’ve been making these fabulous little Duchess potatoes for years. For the longest time I simply used a potato masher and made sure there were no lumps so that they are easy to pipe, and that’s definitely an option but I’ve found a better way! I recently discovered a magical little gadget called a potato ricer! 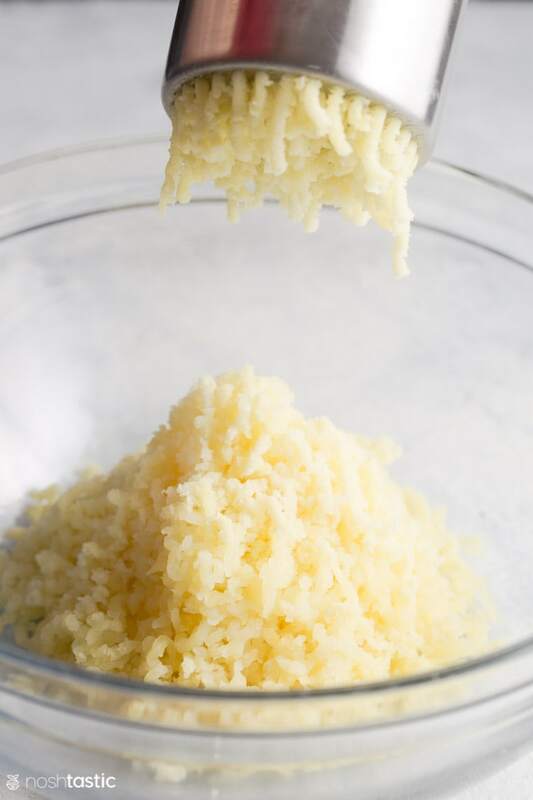 It makes the smoothest, creamiest mashed potatoes I’ve ever tried and it’s remarkably satisfying to squash a whole cooked potato into one end and get lovely riced potatoes out of the other end! It makes piping the Duchess potatoes SO much easier and it’s 100% lump free, so I highly recommend it. It’s also not a large or expensive gadget, I keep mine in a small kitchen drawer. Once you’re ready to pipe you’ll need a piping bag fitted with a wide star tip such as a 1M tip or something similar. If you do not rice the potatoes you need to ensure you have zero lumps or that will make it really hard to pipe them. If you do not have a piping bag you could try adding the potatoes to a ziplock type bag and cut the corner off and try piping it out of that, but it won’t look nearly as good. Or, if you don’t want to do any piping you could just spread the potatoes out in casserole dish and create a rough surface with a fork and bake for the same time. If you’re cooking for someone who is dairy free you can use a dairy free butter substitute such as Earth Balance, or Pure Margarine if you are in the UK. You can peel the potatoes ahead of time and as long as you submerge them in water until you are ready to cook them you’re good to go, they will start to oxidize and turn brown if you peel and leave them sitting out too long. Once boiled you can mash them, add the butter and eggs, and mash, then you can pipe them out on a lined baking sheet until you are ready to bake. To save time we usually make them like this on the morning of the day we plan to serve them as piping can take longer than you think and requires a little bit of effort! 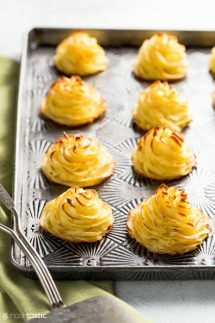 Pretty, piped, Duchess Potatoes! easy but fancy baked mashed potatoes. They are Gluten Free, vegetarian and whole30. Boil the peeled potatoes in water for about 15 - 20 minutes or until they are soft, but not over cooked and mushy. Once they are cooked drain well, add in the egg yolks, butter and a little salt and pepper. Add the mashed potatoes to a piping bag fitted with a wide star tip, a 1M tip is what I use. If you do not have a piping bag you could try adding the potatoes to a ziplock type bag and cut the corner off and try piping it out of that. Pipe onto the parchment lined sheet pan to make small swirly shapes. Brush with a little melted butter to help them brown. Bake in the oven for about 20 minutes until they turn a little brown on the edges. Make ahead - you can peel, boil, mash, and pipe these Duchess potatoes ahead of time, we like to prep them on the morning of the day we will be eating them. Dairy Free - you can use any dairy free or vegan margarine instead of butter. We like Earth Balance, if you are in the UK you can use PURE margarine. Nutrition - based on four servings, so divide the total amount by four to get the serving size. It's hard to estimate the exact number of piped potatoes because it really depends how small/big you make them. I’ve never made duchess potatoes before. They are SO beautiful & I can imagine delicious too! Such a perfect way to make a special dinner even more special! Egg Yolks! That’s the secret! I knew I was missing something! Awesome and beautiful recipe! These potatoes look so good! I love how they are soft on the inside and a little crispy on the outside…delicious! hi, after the potatoes are cooked, should i peel them before i mash & mix? Tnx! Excited to try!!! 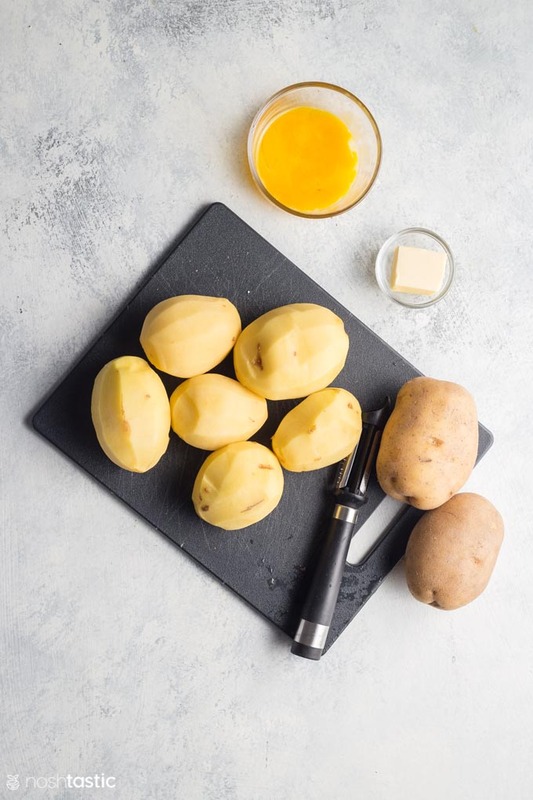 Hi Sheila, You will find it easiest to peel the potatoes first before cooking them, then if you cut them into evenly sized chunks you will find that they all cook (more or less) at the same time, hope this helps! These look beautiful! I love cooking with potatoes and am pinning this so I remember to make it soon! Thanks Mary, I hope you enjoy them! These look great! Can’t wait to give them a try! Thank you!! Thanks Sue, I hope you like them! I thought potatoes were not paleo. I know sweet potatoes were allowed but whites potatoes? I’m a little confused. it really depends which expert you ask I think, some say they are paleo and some don’t. Potatoes are now allowed on Whole30 diet too. Personally I’m of the opinion that real potatoes, especially new potatoes, are nutrient dense whole foods and have been unfairly vilified. I admit to being a little biased as I grew up in the north of Scotland where I ate homegrown potatoes from my Grandfather’s garden on a regular basis. Could you make these ahead of time and freeze? If so, what would your recommendations for cooking be? Keep them frozen and preheat oven? Hi Shelli, I’m afraid you can’t really freeze potato very well, so I wouldn’t recommend it. Could these be made the day before and then baked just be baked just be fore serving? You could make the mashed potato mixture ahead of time and keep it in an airtight container in the fridge, but I think that if you piped out the potatoes too far ahead they will dry out and not be very nice. Thanks for your wise advice! Okay so here is my fear….I am preparing my in-laws 45 anniversary dinner and this is exactly what I want to make. My massive fear is when I take them off the parchment paper to plate are they going to come off nicely or am I going to be facing a pinterest fail. Any tips?!?! Hi Sarah, they won’t stick to parchment, but they might stick to foil or wax paper so don’t use those. I’d advise trying them at least once before the anniversary dinner. 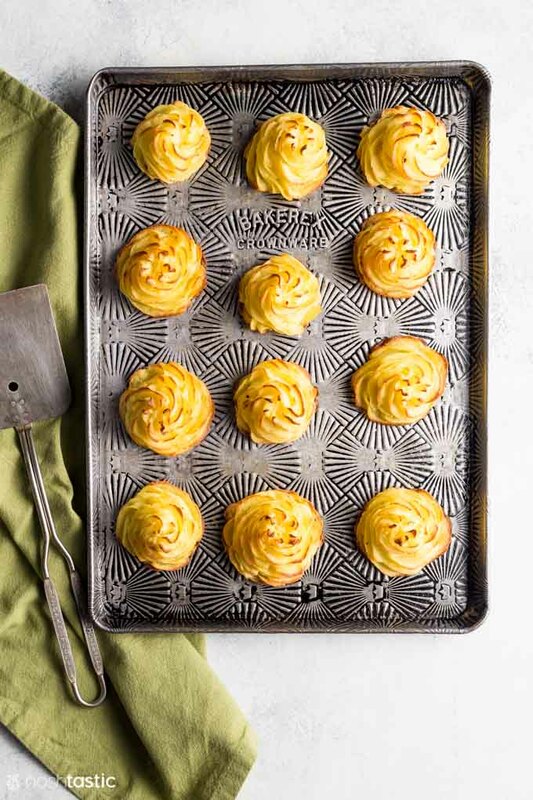 My tips would be to make sure you have no lumps in the potato or it will be hard to pipe them, and give yourself plenty time to pipe them out, it’s much harder to pipe mashed potato than frosting!